Chicago, Ill. – In a startling report from the Guardian, details have been revealed about Chicago police detaining American citizens at “black sites.” These sites are similar to those used by the CIA around the world to interrogate/torture alleged terrorists. The stunning revelation of the Chicago Police Department operating what amounts to an off-the-books interrogation facility is threatening, to say the least. The facility apparently operates outside the bounds of the U.S. Constitution, and its discovery exposes the very real and present danger of the threat posed by the police state to American freedom and liberty. (Truthstream Media.com) With renewed interest by activists, scientists and concerned citizens in removing fluoride from municipal water supplies across the country, it is useful to remember that fluoridation has always been controversial. Even as use of the chemical was being introduced as a “benefit to teeth”, many people of the day were already armed with information to put them on guard and make them outraged at the ill conceived and perhaps nefarious scheme thrust upon the population. The following is not an exhaustive account of the battle against fluoride, which has affected the long-term health of nearly everyone in the United States and much of the Western world whether they know it or not, but these newspaper clippings hold some interesting clues and fragments that to piece together more or less how this monstrosity came to be in spite of the fact that many people were sharply against it – and with good reason. Much of the history of water fluoridation has been documented in detailed works including Dr. Paul Connett’s The Case against Fluoride and Christopher Bryson’s The Fluoride Deception. Remember, water is used for much more than just drinking – it is obviously also used for bathing, cooking, cleaning, gardening, irrigation, swimming and industrial processes such as cooling as well. It permeates our lives, and fluoride has created an ongoing source of background contamination that is uniquely added to our environment deliberately under false pretenses. 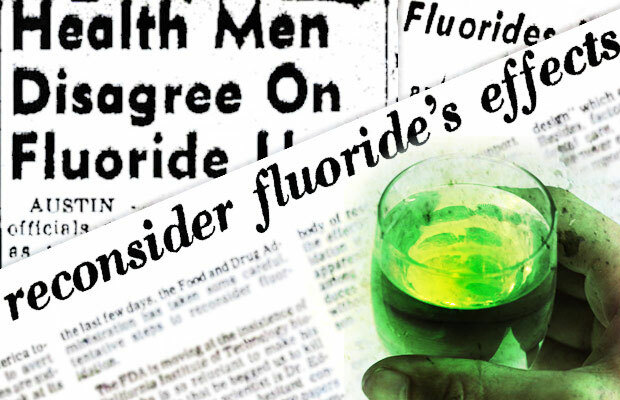 Read more and see video and reproductions of headlines from the ’50s at Concered Citizens Warned of Fluoride Dangers in the ’50s, but We’re Still Drinking It Anyway | Truthstream Media. There is nothing wrong with getting somebody who knows how to sell something. Corbett: How many TRILLIONS did the Pentagon “lose”?